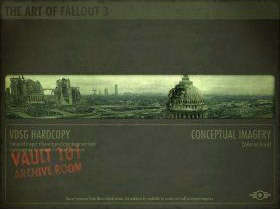 I bought this book from ebay including the making of Fallout 3 disc for £4.99. Originally it was bundled in a Fallout 3 collectors edition. It’s a small book, the same size as a DVD case but packed with almost 100 pages of concept art from the game. Artwork is by Adam Adamowicz and Craig Mullins. I’ve been playing Fallout 3 for a while now. It’s a great game which I highly recommend to those who enjoy a post apocalyptic adventure with a great story, graphics and gameplay! The best bargain was the Art of Mass Effect from Gamestation – RRP £14.99. It was old stock reduced to £7.49 but when I took it to the counter it scanned in at 1p and that’s the price I was asked to pay! Bargain of the year so far! !